Dental implants are artificial roots that serve as a replacement for missing teeth. 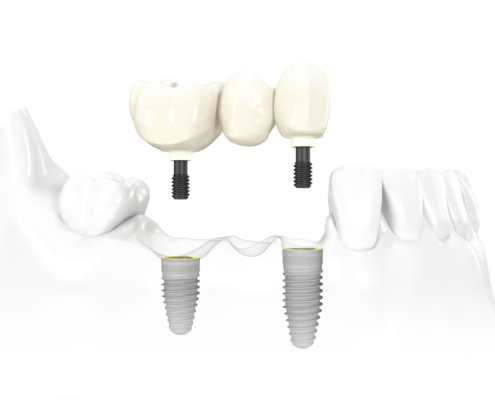 Research indicates that dental implants’ biocompatible surfaces actually stimulate the required fusion with the bone. Once it has been achieved, the crown, bridge or whole tooth replacement can be fixed to the implant or implants to feel like natural teeth. Dental Implants are the best alternative to your own teeth and can provide a lifetime of excellent chewing and aesthetics. Patients who have been treated with implants are able to chew all the foods they desire and no longer have to suffer the embarrassment of having their teeth come loose in public. 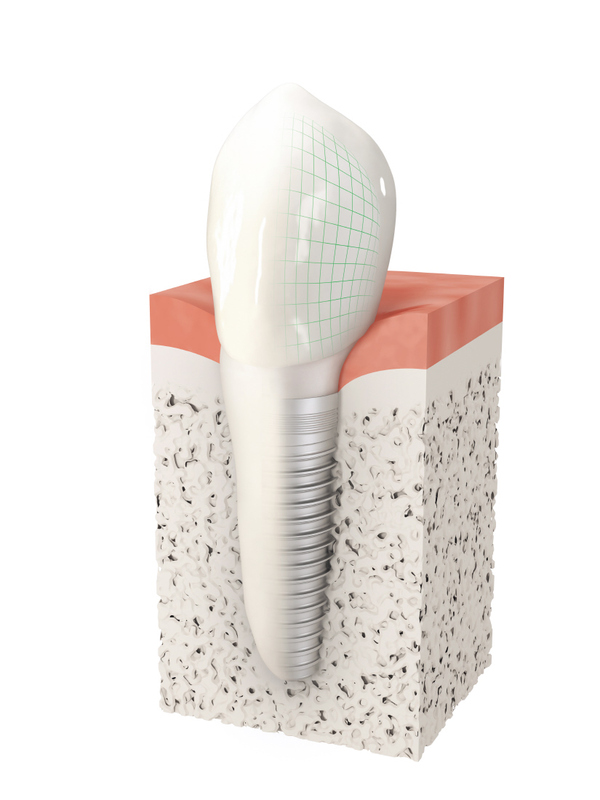 Each year millions of implants are successfully placed in patients throughout the world. In light of a very high treatment success rate, it is no wonder the trend toward implants continue to grow. Teeth as individual as you. Dental Crown and bridge are replacement teeth that are individually produced to meet your own personal needs. It is recognized that all ceramic crown and bridges offer the best esthetic solution. Restoring teeth has been a mainstay of modern dentistry for many years. But only after the advent of dental implants and ceramics have patients been able to enjoy restorations that feel, function, and look like natural teeth. Modern dental restorations are supported by either the remaining natural teeth, dental implants or any combination of the two. Titanium is currently the most suitable implant material. Titanium implants are biocompatible and do not trigger any allergic reactions. Modern dentistry is undergoing a rapid advancement of solutions and products to satisfy all patient requirements, improving daily chewing function and restoring personal appearance. Delivering a proven, successful solution. Dental implants are widely recognized to be the most successful method of tooth replacement used today. Placed by specially, trained dentists, implants and modern prosthetics are hard to tell apart from your natural teeth. The color, shape and contour of replacement teeth can be adapted to match that of your natural teeth. And with dental implants, healthy teeth do not have to be compromised. Maintaining your natural bone is one of the most important advantages of dental implants. With missing teeth, the bone begins to resorb over time. Significant bone loss can shrink the contours of the jawbone, causing wrinkled lips and a sunken mouth and chin. Dental implants can help counteract that by preventing resorption of the jawbone, stimulating bone growth and stopping bone loss. With conventional dental bridges, adjacent teeth are used as anchors and must often be ground down. Dental implants eliminate this need and allow natural, healthy teeth to be preserved in their original state. The latest prosthetics and implant solutions are very durable. They are more stable, more comfortable, and more functional than conventional dentures. And because dental implants are made of biocompatible materials, they are also more tolerated by the body. With proper care and good oral hygiene, a prosthetic solution will last for many years. A dental implant can actually last a lifetime. 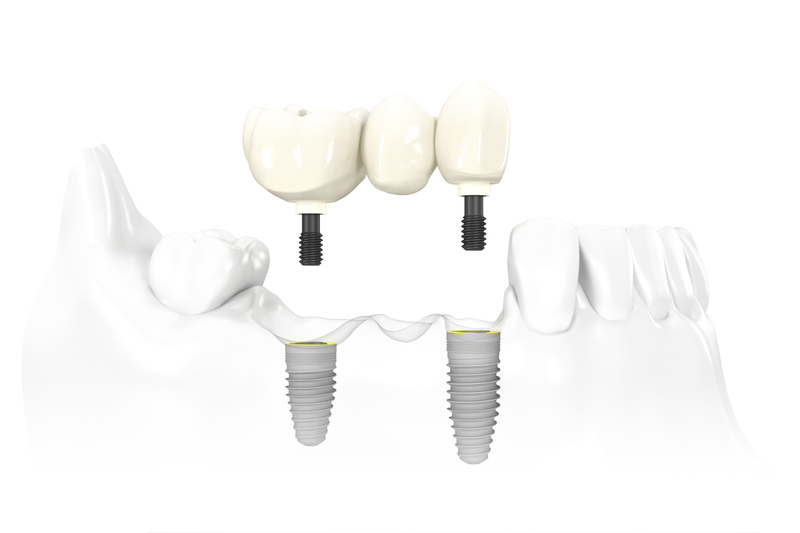 In ideal cases, implants can be placed in as little as one session. Your treatment plan will, be dependent on your particular clinical situation. Depending on the treatment procedure, it may take between one and two hours. Afterwards, the implant often needs time to integrate so that it can fuse with the bone. The better the quality of the bone, the better the conditions and the shorter the treatment duration. Depending on the clinical situation, a temporary tooth may be provided during the integration period. Once this integration phase has been successfully concluded, the final replacement tooth can be attached. The dentist will first make careful diagnosis and examine whether the conditions for implant treatment have been met. It is essential that gum and bone are free from inflammation (periodontistis) and tooth decay. If necessary, these conditions are also treated. During a diagnosis, the quantity and quality of the bone is also thoroughly examined. 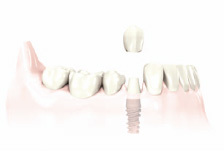 If there is an inadequate amount of bone for implant treatment, it can also be built up. Implant placement can be performed very quickly and, thanks to local anesthesia, it is relatively pain-free. With careful preparation and execution, the treatment should conclude without problems and with minimal risk. 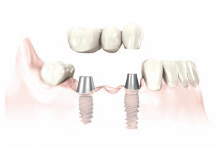 In the vast majority of cases, implant integration occurs quite quickly and without problems. 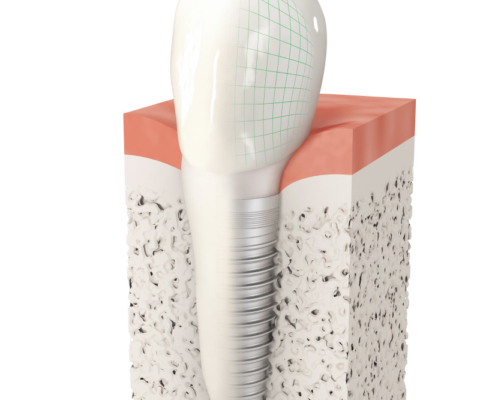 Typically, any minimal discomfort experienced following implant insertion improves rapidly. 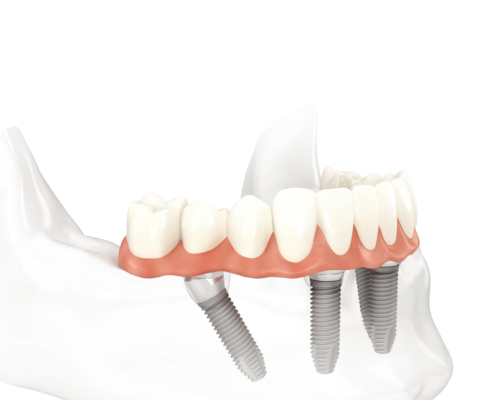 In a minority of cases, it may take up to a year for the implant to fully integrate with the bone. 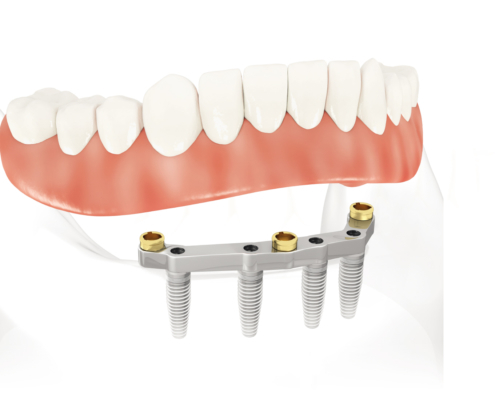 The last step of any implant treatment is the attachment of the final new tooth or teeth. In some cases, this can be performed immediately after the implants have been placed. 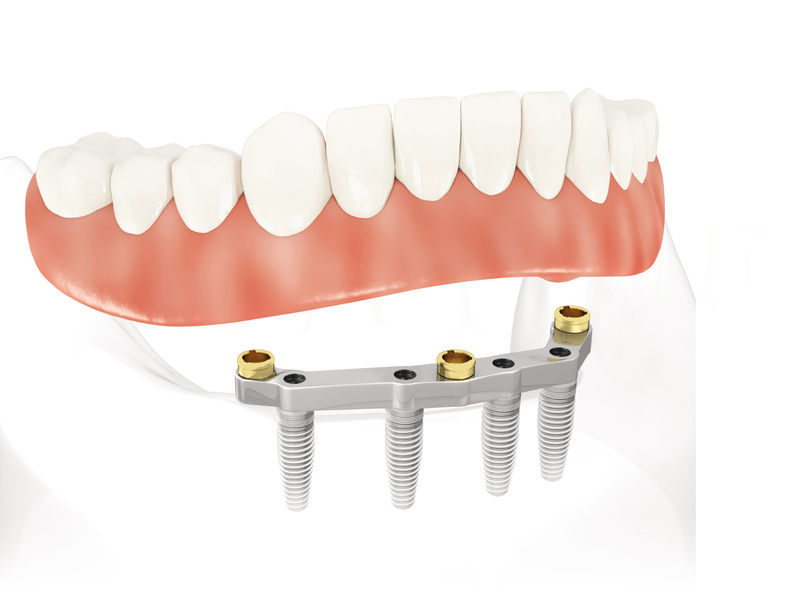 In most cases, however, a temporary tooth is placed while the implants integrate with the jaw bone and the final replacement teeth are being manufactured. Final teeth are individually designed. These high-precision custom-made crowns and bridges-often made of all-ceramic biocompatible materials-are attached to implants using cement or tiny screws. Careful preparation and implementation of prosthetic or implant treatment reduces risks to a minimum. Implant treatment is nonetheless a surgical procedure. As such, it is associated with certain risks. Under normal circumstances, the swelling and mild pain, which may occur often disappear after a few days. Periodontitis, poor oral hygiene, inadequate wound healing, cigarette smoking, or serious general diseases (e.g. diabetes) are also risk factors, which depending on their severity, may be contraindication for dental implants. Your dentist will glad to provide you information about potential complications and risks. How long implants and new teeth last, depends primarily on how well your teeth are cared for. If you have good oral hygiene, including good home care and regular dental check-ups, your implants can last for many years, possibly up to an entire lifetime. 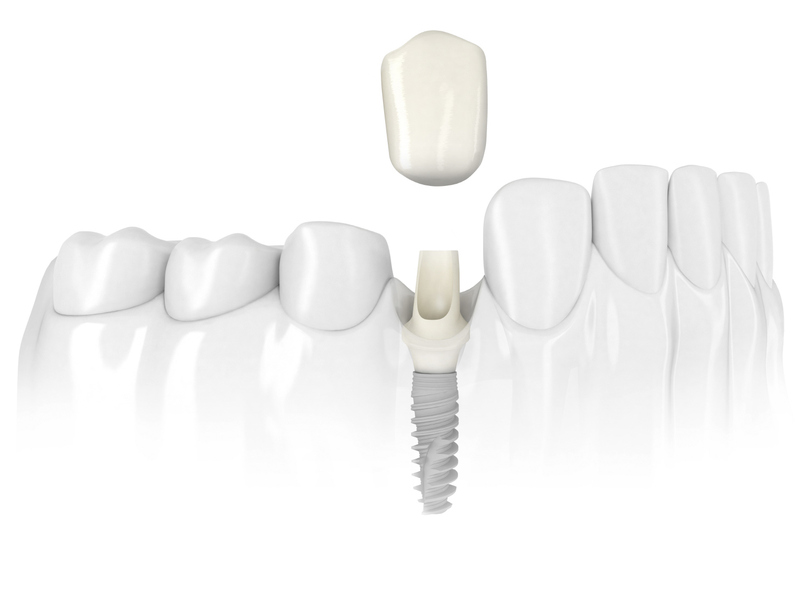 If you are missing only one tooth, an all-ceramic dental crown on a implant is often the best choice. 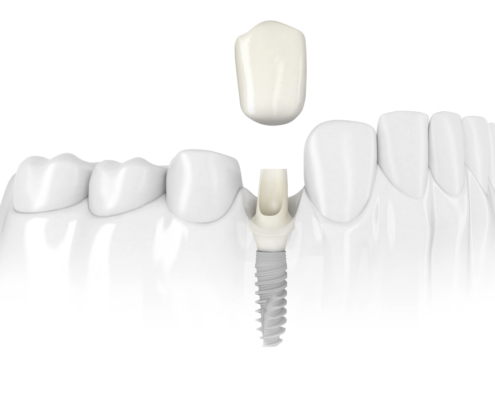 The implant serves as a foundation for dental crown. The ceramic crown is then attached to the dental implant. It matches the shade and contour of your natural teeth so that no one can tell the difference. Replacing a signal tooth with implant-based solutions does not compromise healthy adjacent teeth, nor is there a risk that continuing bone loss will weaken neighboring teeth. 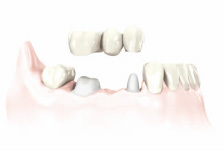 For two or more missing teeth, a bridge cemented to natural teeth is an economically viable, long term solution. The bridge is supported by the adjacent natural teeth, which must be ground down beforehand to serve as a support for the new bridge. 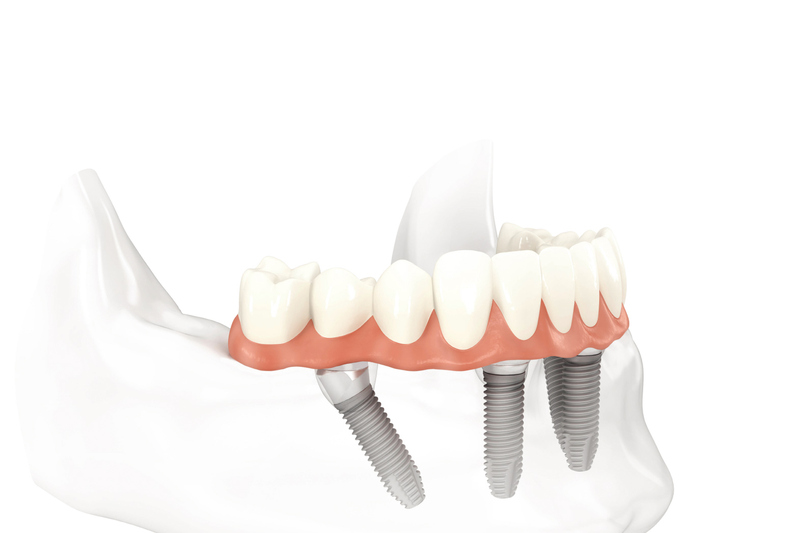 A bridge supported by implants counteracts bone loss and protects the remaining healthy teeth. If two or several teeth are missing, a bridge firmly anchored to implants provides as esthetically pleasing and functional results that helps prevent further loss of natural bone. Missing all your teeth can have a devastating impact on quality of life. It often makes people appear older than they actually feel. Conventional solutions include adjusting the denture base to the gum tissue with either a dental adhesive or by holding it in place with a seal along the border of the denture. The success of conventional solutions depends large on the amount of residual bone and soft tissue. The loose attachment of the tooth replacement can also reduce chewing capacity, which can lead to an unbalanced diet and poor digestion-crunchy vegetables and fruits, for example are almost impossible to eat. Bone loss may also progress, and the functionality of the tooth replacement will increasingly diminish. When the palate is covered by an upper denture, a reduction in the sense of taste can also be expected. 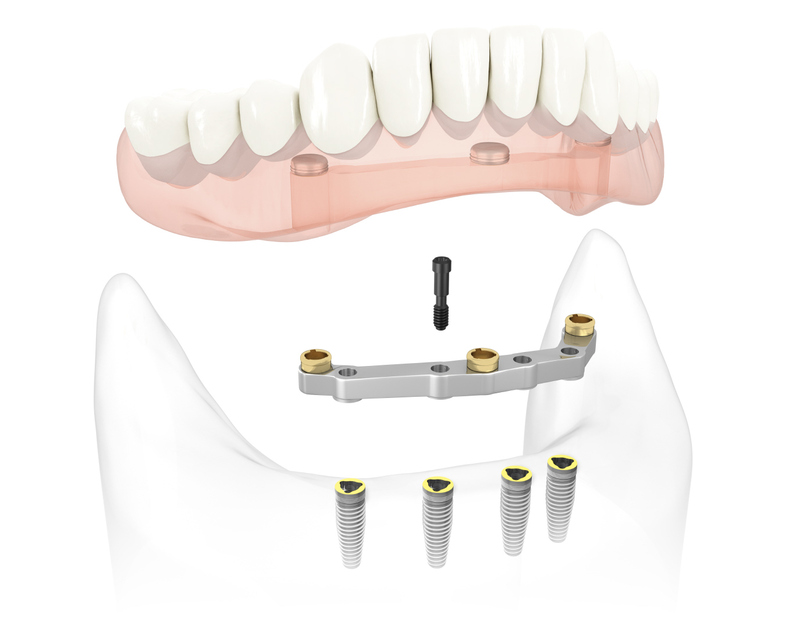 Removable tooth replacement on implants. A removable prosthetic secured on two or more implants using mechanical anchors, which retain the prosthetic in a very secure way. After placement, an implant-supported prosthesis largely functions and appears just like natural teeth. The sense of taste is also preserved, as the roof of the mouth is not covered with an acrylic denture. Another advantage is that the bridge can be removable for cleaning. Removable bridge on an implant bar. The bar serves as a supporting element for a removable prosthesis and is supported by two or more implants. The prosthetic attaches to the bar to provide secure retention. Here again, the prosthetic can be removable for easy cleaning. A fixed prosthesis consists of a dental implant bridge supported by four or more implants. The prosthesis is fixed firmly to the dental implants and the gum remains free. As a result, taste sensation is maintained. 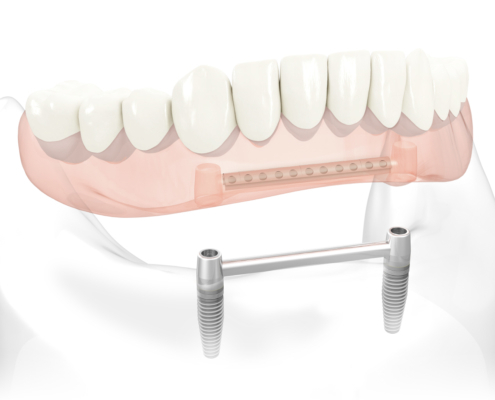 Screw-retained bridges allow teeth to function without restrictions. Deformities in the upper or lower jaw can leave you with inadequate bone in which to place dental implants. This defect may have been caused by periodontal disease, wearing dentures, developmental defects, injury or trauma. Not only does this deformity cause problems in placing the implant, it can also cause an unattractive indentation in the jaw line near the missing teeth that may be difficult to clean and maintain.